Onmund is a Nord sorcerer enrolled at the College of Winterhold. He will most likely be encountered for the first time during a lecture given by Tolfdir for the newly enrolled apprentices. Afterwards, he can usually be found during the day practicing spells in the Hall of the Elements until around 4pm when he will head back to his room in the Hall of Attainment. Attempting conversation with Onmund during the lecture will have him dismiss you with a "Shhh!" When class is over, you may now talk to him, and he will greet you with, "New here too, eh?" 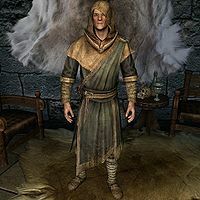 If you are a Nord, he will comment, "It's good to see another Nord. I feared I'd be the only one. Almost doesn't feel like Skyrim, being so far away from the rest of the world here." 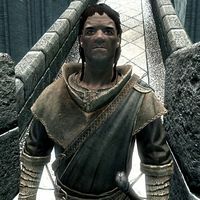 If not, he will be disappointed and instead say, "I'd hoped I wouldn't be the only Nord, but I should've known better." His particular interest is Destruction magic, specializing in shock damage spells. In battle, he prefers to stay at range dual-wielding spells, though if an enemy comes close he is not above using a ward for defense. Onmund knows the Destruction spells Chain Lightning and Lightning Bolt, the Illusion spell Invisibility, and the Restoration spells Fast Healing and Lesser Ward. Onmund wears novice robes of alteration, a novice hood, and a pair of boots. 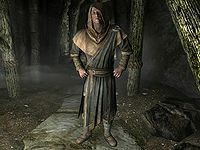 Onmund may greet you with a few warnings about the Nords' disdain of magic, saying, "The College is a bit of an oddity in Skyrim. Magic isn't something that's looked upon fondly here. ", "Nords don't trust magic, or those that use it. Made it difficult for me growing up. ", "They won't say much, but most people have very strong opinions about the College and those that study here. ", or "Don't expect the local Nords to take kindly to you once they find out you're from the College." After Under Saarthal is completed, he will still view the excavation in poor taste: "We shouldn't have been disturbing Saarthal, no matter what you found down there." After the quest The Staff of Magnus is completed, Onmund will have even more to say: "I never would have suspected that the Eye could be so dangerous. Tolfdir is right, isn't he? Magic really can overwhelm you. ", "I've certainly learned more here than I ever expected to. ", "Thanks to you, the people of Skyrim will continue to have a place to study magic. Even if most of them resent you for it. ", and "I wonder if the College's reptuation [sic] will ever recover from our adventures." Since a young age, Onmund has possessed an interest in the magical arts. This put him at odds with his family, who wanted him to lead a life more typical of Nord culture. When asked if it's difficult being away from his family, Onmund will reply: "Not at all. I consider it a blessing. My family was convinced coming here was a death sentence, or worse. It took years of insisting that this is what I'm meant to do." Despite this, he does admit he made a mistake in selling his family amulet to Enthir and wishes to have it returned, but Enthir refuses to go back on a deal. If you manage to get his amulet back, he will be thankful and become available as a follower. You can also marry him or recruit him into the Blades. 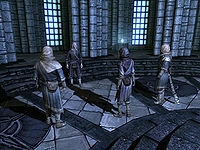 When asked, Onmund will elaborate on why there aren't many Nords at the College, saying that "Magic is shunned by most. If it can't be swung over your head and used to crack skulls, most Nords want nothing to do with it. Magic is seen as something for elves, and weaker races." and adding "No offense, of course." if you are not a Nord. He will also explain why his fellow Nords have a problem with the College: "Well, look at the evidence. Nords generally don't trust magic, so it's not off to a good start. Throw in the Oblivion Crisis, which was caused by magic-users, and the troubles now with the Aldmeri Dominion, who are elves and magic users. And finally take the fact that the College is the only thing left standing after most of Winterhold was destroyed. It's all fairly damning." 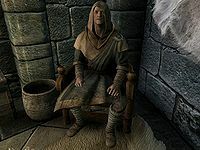 Onmund shows suspicion of Ancano, Arch-Mage Aren's advisor, and will tell you such: "I know he's from the Thalmor, and that he claims to be here simply as an advisor. I also know that no one really believes that. I've been trying to avoid him, honestly." Inquiring him about the Augur of Dunlain for the quest Good Intentions will have him direct you to Tolfdir: "I've never heard of anything like that. Did you ask Tolfdir? He's been here a long time, and seems to know almost everything." He will also comment on the sudden appearance of a Psijic monk: "No one's heard from the Psijic Order in so many years. Hard to believe one would just suddenly show up here." Upon discovering Arch-Mage Aren's death, Onmund will exclaim, "Shor's blood, what have they done?" as he mourns. After you retrieve the Staff of Magnus, he may be found saying, "You're still alive!" or "Get to the College, before it's too late!" If asked what he is doing here, he will instead urge you, "There's no time! You have to get back to the College as fast as you can!" and state something interesting: "Mirabelle is dead, and they're losing ground fast. I'd be there now if I hadn't seen... I had one of your 'visions', I think." before digressing, "Go on, get moving! I'll try and clear a path for you." As members of the Psijic Order materialize to take the Eye of Magnus after Ancano's defeat, he will comment, "If only we'd stayed out of Saarthal." "Why not give us a chance to show you what we can do?" The professor will then address you, "You've been quiet so far. What do you think we should do?" If you confess you're not really sure what to think, he will reply with, "Not going to weigh in either way? I admire your restraint, but there are times when you must make decisions, even without all the facts. Rely on instinct." Onmund will add to this, saying, "We're all pretty new at this, right? Let's just give it a chance. What's the worst that could happen?" No matter your option, Tolfdir will eventually give in and ask you to cast a ward while he casts a spell against it. Onmund and the other students will stand behind Tolfdir to watch the demonstration. "I find it hard to believe this excavation was approved." Brelyna: "Can you believe we're here? Saarthal, of all places." Onmund: "I'm surprised that the College is allowed to excavate here." Brelyna: "I bet your family would be amazed, right?" Onmund: "Amazed isn't the right word. They might find this... offensive." J'zargo: "Are you excited to see what's in there? This is important to you Nords, isn't it?" Onmund: "Not excited, no. Some very bad things happened here." J'zargo: "Oh, right. That whole thing with the elves. Well, it all worked out in the end, didn't it?" Onmund: "I think, given the state of Skyrim, some might disagree." When near him, he will remark: "Can you imagine what it was like, living here so long ago? The first men in Tamriel, here..." or instead express disapproval at Saarthal's excavation, saying either "I'm not so sure we should be here. ", or "I find it hard to believe this excavation was approved." Asking if he's not happy about being here, Onmund will reply rather bluntly, "No. There's no chance anyone in authority approved this. Our ancestors should be allowed to rest in peace." If you ask him why he thinks the College is here, he will show more open-mindedness to the excavation: "Hopefully we can learn something from the experience. How the ancient Nords used magic, maybe even what happened to this place." Brelyna: "This is a little creepy." Onmund: "That doesn't begin to describe it." Brelyna: "You seem uncomfortable being here." Onmund: "I just don't know that it's right for us to be in here like this, picking through the ruins [sic]." "I need your help with something. Something private." Back in the College, Onmund will seek your aid: "I need your help with something. Something private." If you ask if something is wrong, he will confirm, "Yes, but it needs to be kept quiet. I may have entered into an... agreement with Enthir. He had something I needed, so I traded him something of mine. It was a mistake, and now I want back what I gave him. It's an amulet that belonged to my family, and I never should've given it to Enthir. But he won't deal with me. Talk to him; see what it'll take to get my amulet back." He will refuse to name what he needed from Enthir: "It doesn't matter. It's also none of your concern. Just talk to him; see if you can convince him to give my amulet back." You can instead ask him why the amulet is so important to him: "I told you, it's from my family. I don't... I know they always disapproved of what I wanted in life, to learn magic instead becoming a farmer, or a hunter. But no matter how poorly they may have treated me, they're still my family. I didn't consider that until after I'd made the trade." Telling him you're working to retrieve the amulet will relieve him: "Oh, good. I was really afraid I'd lose it forever." If you have the amulet, he will be grateful: "Ha! I didn't think he'd really give it back. Thank you, friend. It's good to know I can count on you." Onmund was supposed to talk with Brelyna about their families, but doesn't due to a bug. Brelyna: "Still no word from your family?" Onmund: "No, and I'm not expecting any." Brelyna: "Really? That must be so nice. I came all the way to Skyrim just to get away from my family's expectations." Onmund: "My family didn't really approve of me coming here at all." Onmund: "Have you heard from your family recently?" Brelyna: "No, not really. Couriers don't seem to like delivering letters here." Onmund: "Ah, that's too bad." Brelyna: "Not at all. It means I'm not being hounded about my progress at the College." J'zargo was also supposed to approach him for some help, which is prevented by the same bug. J'zargo: "J'zargo continues to struggle with wards. You have time to practice?" Onmund: "Maybe later. I'm sort of busy now." J'zargo: "J'zargo understands. You hesitate because you know J'zargo will be better than you. Very well." When asked to trade items "If it will help you, then certainly." When told to wait "I'll stay here. You try not to get into too much trouble." When told to follow "I'm right with you." Onmund incorrectly pronounces Psijic Order as the "physic order". Onmund will never initiate conversation with his fellow students, as they are set to take place in the Hall of Countenance, where they never go. If you marry Onmund, he may greet you each time you come home with "We shouldn't have been disturbing Saarthal, no matter what you found down there." He repeats this line every few minutes. Onmund, for unknown reasons, may immediately dislike you even if he has not been harmed and all quests related to him were completed (with the exception of The Bonds of Matrimony). ? (DB)Onmund may use Talvas Fathryon's follower dialogue. This page was last modified on 22 November 2018, at 03:05.